After some soul searching I opted to stick with SPD style pedals rather than going to a proper road pedal such as the Look KEO range which William and a few others had recommended. It wasn’t that I doubted the widsom of the advice, but experiences of seasoned audax riders suggest that walking safely and comfortable at stops wins out over strict pedalling efficiency. With a bit of web research, the Shimano A600 pedals and RT-82 shoes seemed to be an almost ideal compromise. The pedals are light, single sided and have a much larger platform than a conventional mountain bike SPD pedal. The shoes are a touring shoe, also light and with a reasonably stiff sole, and an upper that is much closer to a road shoe design. 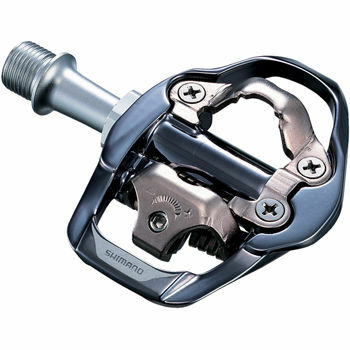 Sadly, cycle touring doesn’t seem to be a big market for Shimano in South Africa and so neither were readily available locally, meaning an online order to the UK was needed. Wiggle were helpful as ever though. The almost final part of the jigsaw for now, was the handlebar. In fact, over the first few weeks riding Jolly, I came to like the entry level Giant bars that we’d fitted initially. So by the time my Wiggle order arrived with the pedals, shoes, and Ritchey Pro Biomax II bar I wasn’t really sure the new and more expensive bar would add very much. Having spent the money though, I figured I should at least give it a try and after a couple of weeks riding with them I’m very glad I did. Many of the reviews I’d read commented favourably on the the small “speed bump” sculpted into the drops, and I have to agree – it makes for a very comfortable position for riding in the drops especially after a prolonged period. With these remaining pieces in place it was time to go have a proper bike fitting. A number of the Wannabees riders spoke highly of Erika Green and her husband Spook, of Daisyway Coaching Systems. Rather handily, they are just a short ride down the road from me, so a visit was clearly in order. In fact, we only got part way through the fitting. Spinning on the stationary trainer, Spook quickly confirmed that my saddle height was correct, but also agreed with William’s assessment that my saddle needed to go back approx 5mm further than my current seatpost allowed. That’s not great news, because it means I have two lovely expensive USE Alien Titanium seatposts that I can’t use. Worse still, it leaves me with just the similarly pricey Van Nicholas seatpost as the only Titanium post with a larger setback. We wrapped up this first part of the fitting with a proper cleat setup, and deferred further saddle and stem adjustments until I could get a Van Nicholas seatpost to try. With a couple of rides done since the fitting, I can already feel the benefit of the proper cleat positioning – definitely helping for a smoother and more natural pedal stroke. I might be imagining it, but it feels like I can lay down more explosive power too when needed, but perhaps that is just a factor of my other training starting to pay off. Just need to wait patiently now for the new seatpost before we can make those final adjustments – and hope that I can sell the surplus USE ones for a decent price locally. 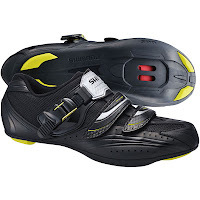 Photographs of Shimano pedals, shoes, and Ritchey handlebar from the Wiggle cycle store website. Photographs of USE Alien seatpost picture from Chain Reaction Cycles cyclestore website.